Do the rims of the Martian craters in the picture above appear to be glowing electrically? They are not glowing, but they look that way for a good electrical reason. 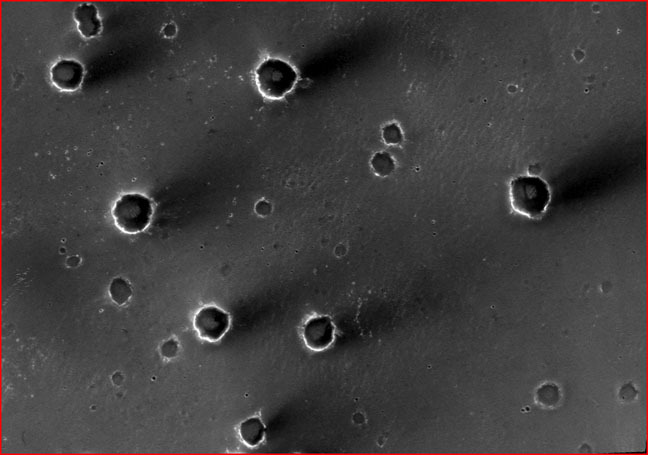 Our picture for today comes from a high-resolution photographic strip taken by the Mars Global Surveyor. It is from the region of Meridiani Planum, on which the rover Opportunity landed in January 2004. (For convenience, we’ve rotated the picture 90 degrees clockwise; north is to the right). The rover visited at least one of the craters in the region, and found that the bright rim is lighter surface material beneath a dark layer of fine sand, intermixed with millimeter-sized granules. In ways not yet understood by NASA scientists, the dark material is created and distributed by Everest-sized “dust devils” and by powerful dust storms on Mars. The landscape exhibited here throws additional light on the electrical nature of the Martian “winds”. We have already observed that the dust devils on Mars “burn” the soil electrically, leaving dark tracks meandering across the Martian surface. 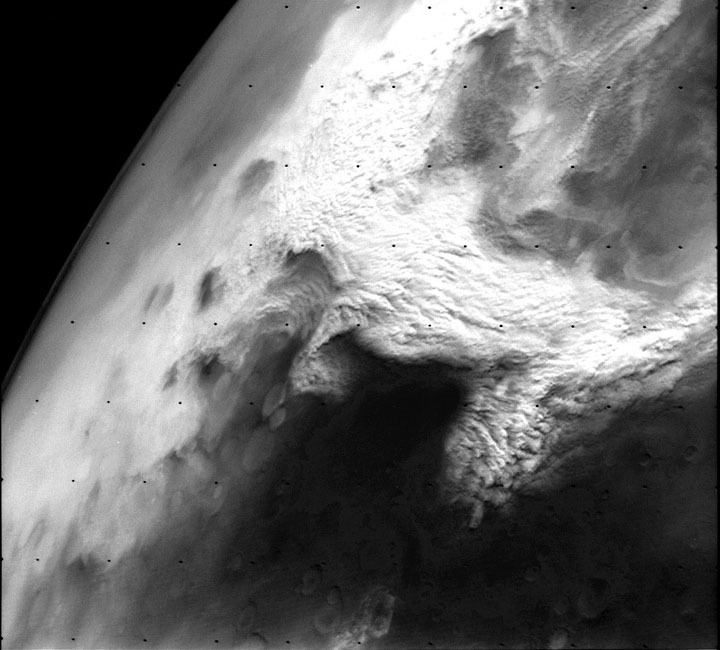 The dark material resulting from electrical storms has covered large regions of Mars. Later, as new dust devils move across the darkened regions, they will often leave a lighter track by removing the darker surface material. When a regional dust storm develops, its leading edge reveals a large complex of tornado-like vortices. 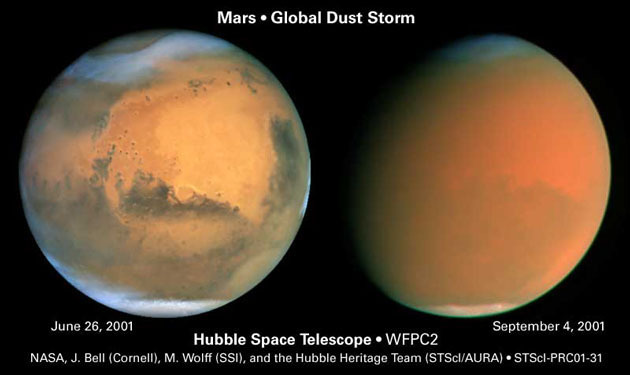 In contrast to a single dust devil, a regional dust storm—sometimes growing to global proportions—can remove much more of the superficial surface material and deposit the darkened dust and grains over neighboring regions. And just as a Martian dust devil moving across a darker surface can create a lighter track, it appears that the more energetic dust storms can create eerie effects on such darkened areas as Meridiani Planum. Little more than common sense scientifically is needed to see these effects in electrical terms. It is inconceivable that that a mere “wind”, in an atmosphere only one percent as dense as the atmosphere of the Earth, could remove dust and grainy material, then elevate them in the vertical fashion implied by pictures of the rope-like tornado columns on the edge of powerful dust storms. In our Picture of the Day for March 24, we suggested, “Closer examination should show that these tornadoes form preferentially on high points and the sharp edges of craters or escarpments”. The effect is clear in the picture above. Material has been removed from the rims of craters in ways that would not be typical of the mechanical effects of wind alone. Note, for example, that the rims exhibit radial “rays” created by the removal of material. The rays extend in every direction around the craters—not in the one direction expected of a mechanical wind’s path. The result is a photographic image recording the electric discharge of the dust storm vortices—imitating the “glow” of the air-to-ground discharge in the contrasting light and dark material left behind. Also significant is the “tangential” component of the darker streaks left by removal of dust from the rims. Many years ago, Ralph Juergens noted this function of a rotating electrical arc. The pattern suggests a counterclockwise rotation of an electrical vortex as it spins off the crater in the direction of the “wind streak” left behind. The familiar winds known to meteorologists do not create selective displacement of downwind material in this way. If planetary scientists will examine these features objectively and in closer detail, they will see the signature of electrical discharge. Though electrical events today certainly cannot compare to the planet-altering events of the past, the tools now available should allow for definitive answers if planetary scientists will consider the electrical phenomena occurring episodically on the planet today.